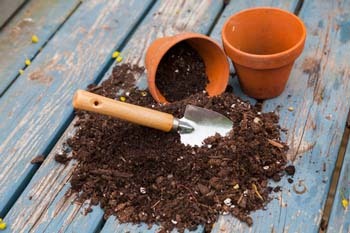 A natural question to ask when growing any plants in pots concerns why regular garden soil is a poor choice. After all, you may have worked hard to build its loaminess by adding lots of organic matter. The next logical question concerns what makes a sterilized, soilless potting mix better. The term "sterilized" indicates that a potting medium is free of pathogens, weed seed and toxins. "Soilless" means that although it contains organic and inorganic matter, it isn't a garden soil. One of the main reasons to use a soilless mix is that it allows water to drain better in a confined space. Garden soils drain poorly in containers. Drainage of plants grown in ground is aided by capillary action, a process that draws excess moisture downward. Planters have limited depth, so they reduce capillary action. Potting mixes, which are often referred to as being "soilless," are more porous than ground soil. They typically have large quantities of materials such as ground bark, coconut fiber and pine needles along with peat moss and perlite to make the mix drain well. When too much water clings to roots, they can't breathe and grow properly. This is particularly true for Salvias and other plants in the mint family (Lamiaceae). So potting soil needs to be well aerated so they won't compact easily when watered. No one kind of potting soil meets all needs. So mixes are different from one region of the nation to another. They also vary based on the kinds of plants for which they are designed. Good potting soils for salvias include mineral matter -- such as sand and rock dust -- which improves drainage. At FBTS, we also prefer mixes containing beneficial bacteria and fungi for healthy root growth. Most commercial potting mixes are amended with nitrogen (N), phosphorous (P) and potassium (K) in varying amounts to help plants thrive. Whereas nitrogen prompts foliar growth and phosphorous encourages flowering, potassium supports plant vigor. Standard soil mixes with a "balanced" combination of N-P-K (nitrogen, phosphorus and potassium) are fine for salvias requiring what we refer to as "rich" soil. However, choose mixes with less nitrogen for plants that like low fertility, such as species native to semi-arid lands. If you need more information about what type of potting mixes to purchase for your FBTS plants, please contact us. We're glad to help your container gardens grow.